US President Donald Trump has arrived in California to survey the deadliest and most destructive wildfire in the state’s history. The Camp Fire, in northern California, has killed at least 71 people. Speaking in the town of Paradise, Mr Trump described the scene as “sad to see” and revisited his disputed claim poor forest management was to blame. “We do have to do management maintenance and we’ll be working also with environmental groups, I think everyone’s seen the light,” he said. “I don’t think we’ll have this again to this extent,” he added. Experts have pointed to the weather, climate change and population shifts as bigger causes of the wildfires. What kind of welcome did President Trump get? 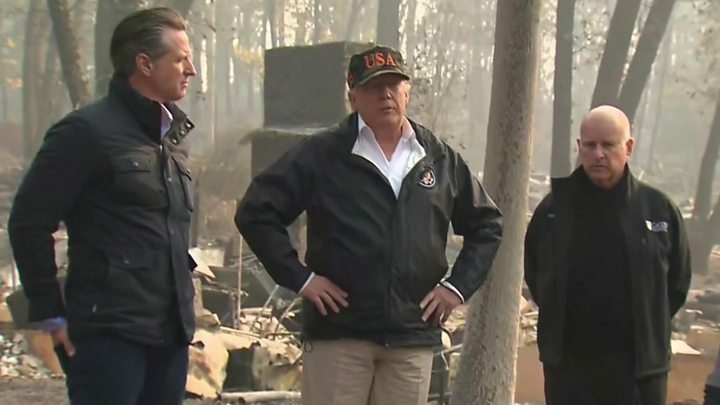 The US president was greeted by Governor Jerry Brown and his successor Gavin Newsom, both of whom are Democrats and have sparred with Mr Trump over the wildfires. “Now is a time to pull together for the people of California,” Governor Brown tweeted. In Paradise, Mr Trump praised the efforts of local law enforcement, politicians and the teams searching for survivors on the ground. Some locals held up pro-Trump signs, although one called him a “moron”. Later in the day, Mr Trump, Governor Brown and Governor-elect Newsom visited an area in southern California affected by the Woolsey fire. Speaking to journalists, Mr Trump and Mr Newsom pledged to work together to prevent future wildfire tragedies. The death toll rose to 71 on Friday after more bodies were found in Paradise, which has been all but destroyed by the fire.